Arsenal manager Unai Emery has discussed new signing Denis Suarez and his adaptation to the Gunners squad. The Spain international joined Arsenal on loan from Barcelona this January and looks an exciting potential addition, having worked with Emery before at Sevilla. However, it will surely take some time for Suarez to get to his best level in the Premier League, which will be an entirely new challenge for him. Speaking about how things are going for the 25-year-old, Emery admits he’s had to undertake extra special training to catch up, but that he believes he’s looking better now than when he first arrived. 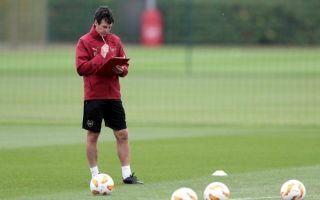 ‘His adaptation to us and also on Sunday in 25 minutes, in the first days with us, is not with good performance,’ Emery is quoted in the Metro. ‘This week he worked Monday alone here with our coaches and also yesterday and today he’s working with a different adaptation, better than last week. I hope he’s continuing to improve every day. Arsenal fans will no doubt hope Suarez can hit peak form soon as the club look in real need of improving their midfield options. Youngsters Lucas Torreira and Matteo Guendouzi have been superb this season, but Arsenal could still do with more experienced options and upgrades on the likes of Granit Xhaka and Mohamed Elneny.